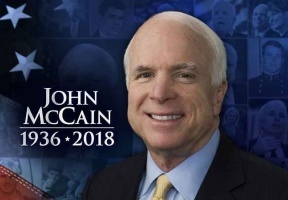 United States Senator John S. McCain, 81, died Saturday, August 25, 2018. I knew him. When the television networks announced that Senator John McCain had won the 2008 Florida Republican Presidential primary, I jumped out of my chair and told my invalid mother that I was sending a donation to his campaign that minute. She asked how much? I said $100.00, she said send him that much for me too. My mother was a lifelong Kennedy Democrat so her pledge surprised me, her lifelong Republican son. She liked Republican McCain because SHE was a member of the “Greatest Generation” and she adored military heroes. John McCain was a military hero in her mind, in my mind and in the minds of millions of Americans. Survival of more than five years as a prisoner of war during much of the Vietnam War made him and fellow American prisoners’ heroes by any definition. Being a journalist, TV commentator, radio talk show host and newspaper columnist as well as a Republican campaign professional for almost 50 years, I lived and breathed the 2008 Presidential campaign. Moreover, I didn’t think much of Democrat Barack Hussein Obama. McCain ran for President in 2000; the year I supported eventual winner George W. Bush. The media loved McCain. Media attached themselves to McCain — the quintessential political maverick — in droves; everywhere he went hundreds of journalists followed him and everything he said. John McCain looked like he might knock off Establishment favorite, Texas Governor George W. Bush. Then came the South Carolina Republican Primary where the media suggested McCain had a real shot at winning. He didn’t win; South Carolina turned on hero McCain by voting for Bush. McCain was left standing alone. On a warm September 2000 day in San Diego my better half and I attended a fundraiser for San Diego Congressman Brian Bilbray at a beach hotel that featured Senator John McCain. Before the luncheon speech, I asked Congressman Bilbray if he would introduce me to the Senator as I had never met him. Sure. We walked over to the Senator and he took my out-stretched hand in both his hands. Both the Senator and I laughed; everyone in the room looked over. The Congressman looked like he was experiencing cardiac arrest. The Senator and I exchanged a Mexican “abrazo”(ah-bra-so) – a man’s hug – and we laughed again. When the lunch was over, we walked out of the hotel and standing alone in front was Senator McCain waiting for his car. No entourage, no gaggle of media. He stood alone. We stopped and talked with him, just the three of us. My better half had bought his new book in New York City just weeks before and he had signed it at the Barnes and Noble bookstore in the Twin Towers (World Trade Center) of New York City which would be destroyed a year later on another warm balmy September morning. Those few minutes I spent with John McCain were, in my experience, priceless. I have recounted the story many times since, especially to military folks. Everyone laughs. One exception: U.S. Senator John Kerry; he didn’t laugh when I told him the story. I’m glad Bush beat him in 2004; no sense of humor. Arizona’s United States Senator John McCain became my personal hero that day in 2000 in San Diego. When Presidential candidate Donald Trump insulted and belittled John McCain for not being a “hero” because he, Trump, only admired men who were not captured, I blew a fuse. Trump’s dislike of John McCain continues even as the Senator’s life ended Saturday afternoon. That is shameful; that shows America Trump’s character. 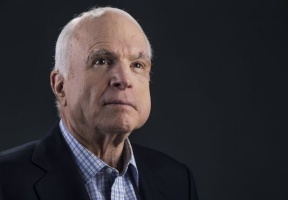 When, then, one compares character of Senator John McCain with anyone else, one can find few men who measure up to the Senator and what he went through over the 1800 days of torture, beatings, broken bones suffered by American prisoners held by Vietnamese Communists. Real men must be measured by standards Senator John McCain left us as his legacy. I wish I could live up to the standards he set. I honor his life and his service to our country. Oorah!